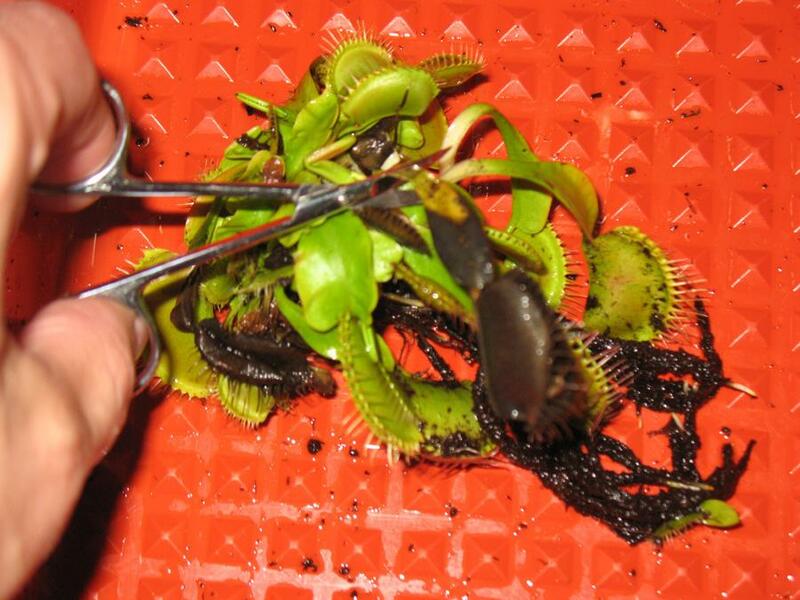 I came across this step-by-step tutorial detailing how to prepare Venus Fly Traps for their dormancy period by placing them in the refrigerator. I am recreating it here with permission from the original poster. 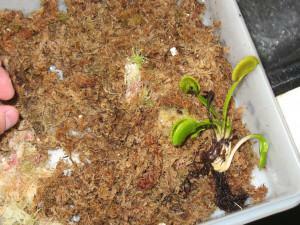 The original article can be found on the Ontario Carnivorous Plant Society website. 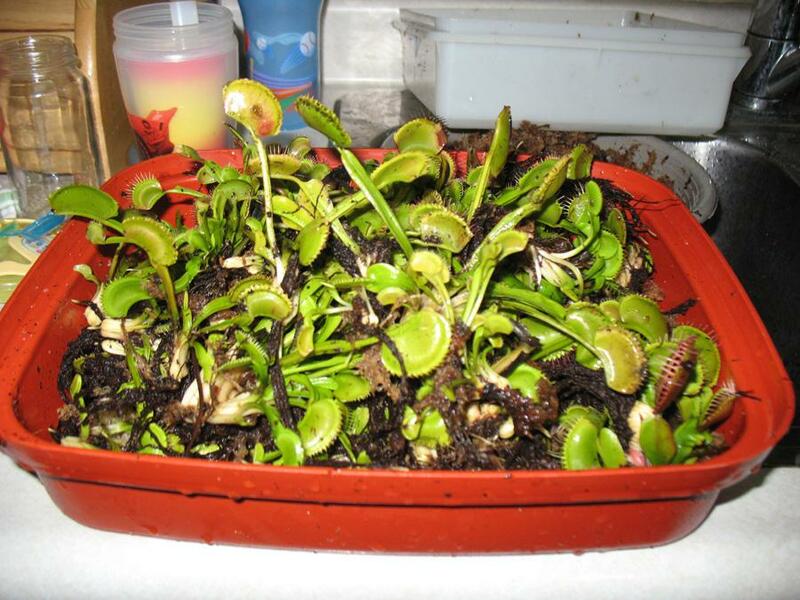 It was written by a user on that site to illustrate the way that he chooses to put his venus flytraps to bed for the winter. This method could be very valuable for growers that have few options when it comes to providing dormancy for their plants. It is a good demonstration of how to put a lot of plants into dormancy with little effort and space. He has over 60 Venus Fly traps, and the whole procedure took him approximately an hour. The original poster of this article said that he has used this method before and didn’t lose a single plant. 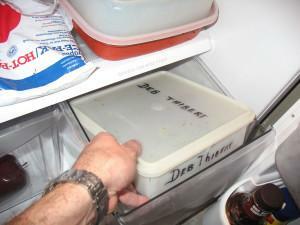 1) Get a Tupperware container or other wide, flat container can be sealed. 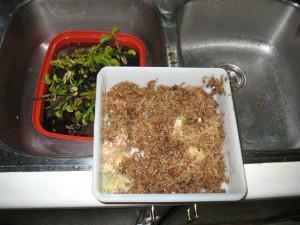 Place a thin layer of long fibered sphagnum moss that is moist but not wet in the bottom of the container. To do this, soak the moss in distilled, reverse osmosis or rain water then wring it out and place in the container as see in the image below. 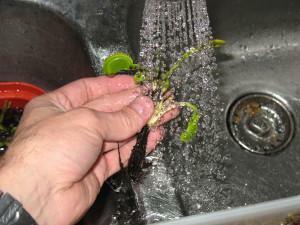 2) Uproot all the plants and rinse off as much soil as you can from the roots. You can use regular tap water for this since there will be no build up of salts and minerals in the soil because you are simply using it for rinsing purposes. 3) After rinsing all the soil off, go ahead and trim off any dead or dying traps. If it’s turning black at all then you might as well trim it off because over the course of winter it will be a source of rot when the trap or whatever is in it starts to rot and is not being digested. 4) After trimming all dead or dying leaves, place the plant on the long-fibered sphagnum mat that you made in the container. Don’t be afraid to stack the plants on top of each other because they are not heavy and the plants on the bottom won’t be crushed by the weight the plants on top. There are about 60 plants in this container. A container full of Venus Fly Traps! 5) Get some “No Damp” or other fungicide and mix it into a spray bottle as per the manufacturer’s directions. Spray all the plants down in the container. Make sure to get it “liberally” all over all the plants and LFS. This should help control the mold that will grow since there is no air movement inside the container. An important side note is to spray the fungicide outside because the stuff smells bad and is probably not too good to be breathing in. Keep the left over mixture because you will need to respray a few times throughout the winter. 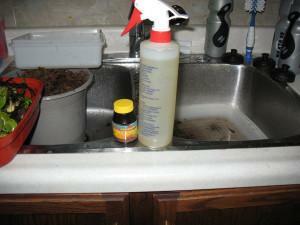 6) Cover the container and place somewhere out of the way in your fridge. The crisper drawer is an ideal place to put it. 7) Do not forget to look at your plants from time to time to catch any mold starting and respray with a fungicide! this is very important because mold will grow! !